I just stumbled across this wonderful video on YouTube, a bunch of guys driving various Porsche 911 models around the beautiful curvy Austrian roads. With a only 35 views and only 2 likes? This video needs some adverting, it’s wonderful! Holy Schnizzle this BLUE SHARK bike is Beautiful! I mean honestly… I’m just drooling looking at this. 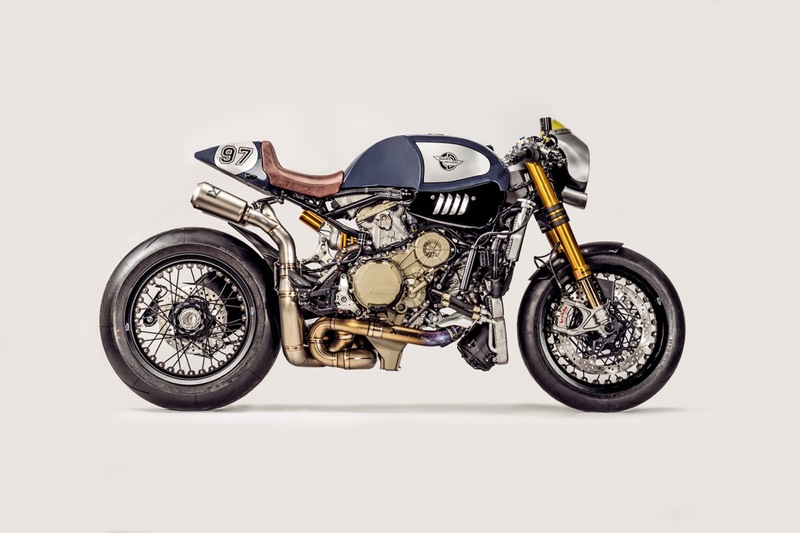 The story is that Ducati got together with one of Switzerland’s aftermarket tweakers (Parts World), Schaub Metalworks and exhaust giant Akrapovic to form the ultimate dream team and create the ultimate cafe racer. And WOW they delivered! The incubator for this mind-bending project was the imagination of Parts World CEO Andy Matter. “The idea for The Blue Shark came step by step,” he begins. “After browsing the web and many other sources, I found out that no one had ever customised a Panigale R as a cafe racer. Moreover, even the Ducati specialists were doubtful anyone would succeed with such a project. That said ‘Hey, it is already the world’s most beautiful sportsbike, you can only make it worse!” “That’s when the trigger was pulled in my head,” says Andy. It just so happens that Parts World is Switzerland’s premier aftermarket distributor and to make this insanity happen, they joined forces with Ducati Zentralschweiz, Schaub Metalworks and exhaust giant Akrapovic to form the ultimate dream team. Instantly they were struck with the first challenge of the build, and clearly one that had deterred others from ever getting past this stage. There was simply wires everywhere, something that shouldn’t surprise given the technological power house that the Panigale is. So hours were spent hiding and re-routing the wiring for the ride by wire, ABS, wheelie control, data analyser, espresso machine and a host of other units including the brains of the operation, the mighty Bosch IMU. The single seat with a vintage-style cafe hump follows the kicked up tail lines of the modern Duke, while still creating a seamless transition with the new tank. To further enhance the look and add to the bike’s muscular shoulders, Schaub crafted some extra gill-like side vents that merge perfectly with the tank.